Office Web Apps 2013 is a stand-alone server web application that provides capabilities to open and render a Microsoft Office Word, Excel, PowerPoint, or OneNote document as a web page. Microsoft SharePoint 2013, Exchange 2013, and Lync 2013 can share the rendering service to display Office documents in those applications as a web page. Additionally, when accessed from within a SharePoint 2013 farm, Office Web Apps also enables rich editing features for those documents. Please follow the server preparation process in the following sections for the appropriate server, either Windows Server 2008 R2 or Windows Server 2012. 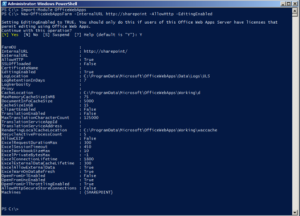 Open a PowerShell command running as an Administrator and execute the following commands to install the required roles and services for Office Web Apps. Please continue with the “Office Web Apps Installation” section below. To begin, open a PowerShell command running as an Administrator and execute the following commands to install the required roles and services for Office Web Apps. Open and run the Office Web Apps setup.exe media to launch the setup wizard. 1. In the Office Web Apps Server 2013 Wizard, on the Read the Microsoft Software License Terms page, select I accept the terms of this agreement and then select Continue. 2. On the Choose a file location page, select the folder where you want the Office Web Apps Server files to be installed (for example, C:\Program Files\Microsoft Office Web Apps), and then select Install Now. Note that, if this folder does not exist, Setup will create it for you. 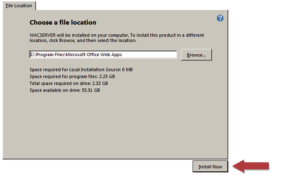 The Choose a file location screen on the Office Web Apps install wizard. 3. When Setup finishes installing Office Web Apps Server, choose Close. After installing the Office Web Apps 2013 server software, you are ready to install any additional add-ins and updates. You can also install any language packs your farm requires. To install the language packs, run the setup media for each of the language packs you desire. If applicable, install the latest service pack Microsoft has released for Office Web Apps 2013 and then apply the latest service packs Microsoft has released for Office Web Apps 2013 language packs. Finally, check for updates on Microsoft Update in the server’s control panel. This section describes how to configure an Office Web Apps farm and join servers to it. Important: Low memory conditions can cause Office document previews to fail in Office Web Apps. Verify that any servers that run Office Web Apps have sufficient memory. The SSLOffloaded command switch configures Office Web Apps for hardware load-balancing, where the load-balancing device manages the SSL certificate and then relays the request to an Office Web Apps server over HTTP unencrypted traffic. This improves the overall performance but does require a secure network between the load-balancer and the Office Web Apps servers. The following image provides an example of the expected output from the PowerShell command. Critical: Before you can use the Office Web Apps farm, you must add your domain to the list of allowed hosts. Once you have provisioned an Office Web Apps farm and allowed your domain, you can join additional Office Web Apps servers to the farm. To join additional servers, install the Office Web Apps software by following the steps in the previous section and then execute the following PowerShell command. On each Office Web Apps 2013 Server, you will need to set a firewall rule to allow Office Web Apps inter-farm traffic and HTTP/HTTPS traffic. Alternatively, you can disable the Windows Firewall if you choose and if you have another firewall solution. 1. In the Windows Firewall with Advanced Security window, click Inbound Rules. 3. 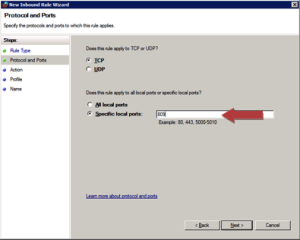 In the New Inbound Rule Wizard window, select Ports as the Rule Type and click Next. 4. Select TCP and enter “809” for the Specific local ports. Click Next. 5. Click Next. On the Profile screen, uncheck Public and click Next. 6. On the Name screen, enter “Office Web Apps Inter-Farm Communication” and click Finish. Run the following PowerShell command to enabled OAuth over HTTP. Run the following PowerShell command to change the WOPI zone to external-https. Finally, verify that Office Web Apps is working by navigating to a SharePoint 2013 document library and verify that you can open a document as a web page.